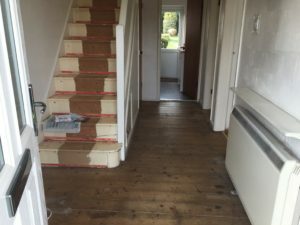 A case study of a Shenstone house clearance. The client required a house clearance of his Shenstone property as he was downsizing to a smaller house for retirement. The house had a mix of gently used furniture from the children that had been raised in the house and antiques from the Victorian and Edwardian era. The house included several very large pieces of furniture, including an antique canopy bed and an oversized Chesterfield sofa in the drawing room. A billiards table and a baby grand piano posed the greatest challenges. The large yard in the front of the Shenstone house meant carrying even the largest items out to the driveway. Thankfully, wide staircases and doorways made the tasks more manageable. A house this large requires a systematic approach to clearance, starting with the main floor to clear the exits, then moving on to the upstairs, and finishing off with the cellar. Several items had to be carefully taken apart in order to be taken out of the house. Two rooms also had to have the carpets removed along with the furniture. The sheer size of the home, three levels that needed clearance, and a number of heavy items made for a long, difficult day, but the crew was easily up to the task. The client was impressed with our ability to handle such large, difficult items deftly and swiftly, noting that it was quite a bit of clearance for a single day. The client found the pricing reasonable relative to the amount of work performed. The client found us honest and forthcoming when it came to the value of some items. Mr. Davies also found our Shenstone house clearance service kind and sympathetic. Do you require a Shenstone house clearance? We are available 9am to 8pm seven days a week and have years of experience throughout the West Midlands, including Birmingham and house clearance Lichfield. Please don’t hesitate to get in touch; we’re a sympathetic professional service with more than 30 years of experience in clearing houses of every size and style. Our services can be tailored to fit your unique needs. Please call us on 0121 681 0111 or 0121-384-5650.